The 1997 film Gattaca is quintessential science fiction. It depicts a dystopian society in which genetic engineering is the foundation for a social hierarchy. People engineered in laboratories are paragons of privilege who enjoy the most desirable careers while those conceived naturally constitute an underclass relegated to the most menial ones. To fulfill his dream of space travel, the natural-born protagonist (played by Ethan Hawke) must therefore forge his genetic makeup to pass a battery of high-tech DNA testing by authorities. It’s a plot that could only take place in the future—yet much of the movie was filmed in a building constructed decades in the past: the Marin County Civic Center in San Rafael, California. Completed in stages between 1960 and 1976, it was the last commission and largest public project by world-famous architect Frank Lloyd Wright before his death in 1959. 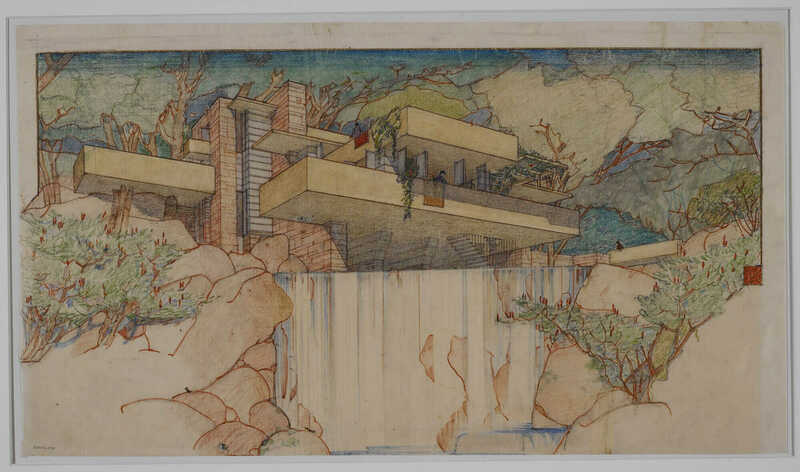 Frank Lloyd Wright’s pencil drawing of Fallingwater (Kaufmann House) in Mill Run, Pennsylvania, 1934–1937. Courtesy The Frank Lloyd Wright Foundation Archives (The Museum of Modern Art | Avery Architectural & Fine Arts Library, Columbia University, New York). Wright’s designs, with their expansive windows, flat roofs, horizontal lines, open plans, and sparse ornamentation, have left a permanent impression on American architecture. His modernist vernacular is just as relevant today as it was a century ago. “The evolution of the practice and theory of architecture in 20th-century America was so stamped by Frank Lloyd Wright that modernism in this country cannot be understood without engaging with his work,” says Barry Bergdoll, a curator in the Department of Architecture and Design at the Museum of Modern Art (MoMA) in New York. To mark the occasion of Wright’s birth on June 8, 1867, Bergdoll and research associate Jennifer Gray organized Frank Lloyd Wright at 150: Unpacking the Archive, a special exhibit that will run from June 12 until October 1, displaying nearly 400 of Wright’s works—including architectural drawings, models, building fragments, films, television broadcasts, print media, furniture, tableware, textiles, paintings, and photographs. 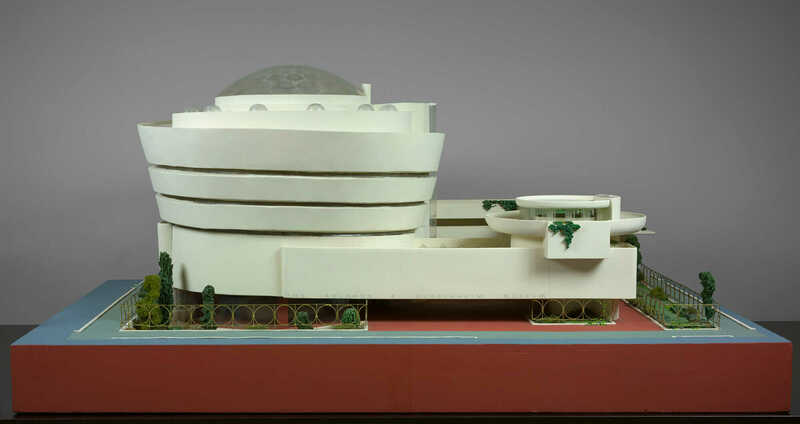 Frank Lloyd Wright’s model of the Solomon R. Guggenheim Museum in New York. Courtesy The Frank Lloyd Wright Foundation Archives (The Museum of Modern Art | Avery Architectural & Fine Arts Library, Columbia University, New York). MoMA is just one of many institutions celebrating Wright’s 150th birthday. 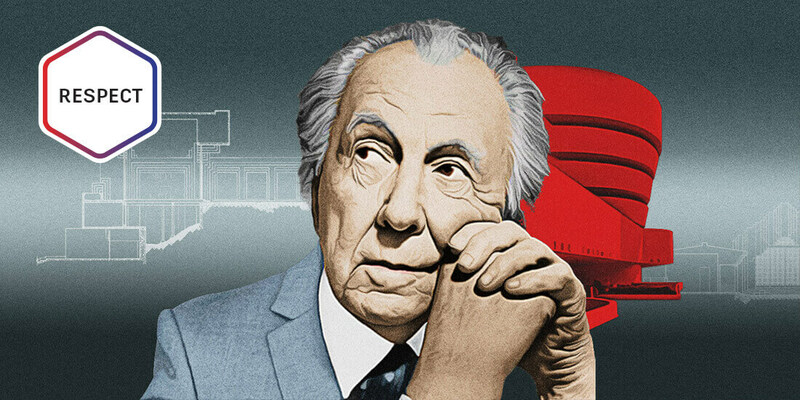 The Frank Lloyd Wright Trust in Chicago is marking the occasion with a series of lectures, tours, and excursions, including open houses at historic Wright sites around Chicago, where he lived and worked. New York’s Wright-designed Guggenheim Museum will have discounted admission on June 8 along with free cupcakes and a performance by a Wright impersonator. And Wright’s Pope-Leighey House near Alexandria, Virginia, will host a special 150th Birthday Picnic and Party fundraiser. And in Buffalo, New York—home to several Wright buildings—the Buffalo Arts & Crafts Alliance will launch a four-month celebration featuring exhibitions and events. So though his legacy is rooted in the past, Wright’s vision is more relevant than ever. Consider these three contributions that Wright made to the American fabric—and their implications for architecture today and tomorrow. Frank Lloyd Wright’s ink-on-drafting-cloth drawing of Darwin Martin House in Buffalo, New York, 1903–1906. 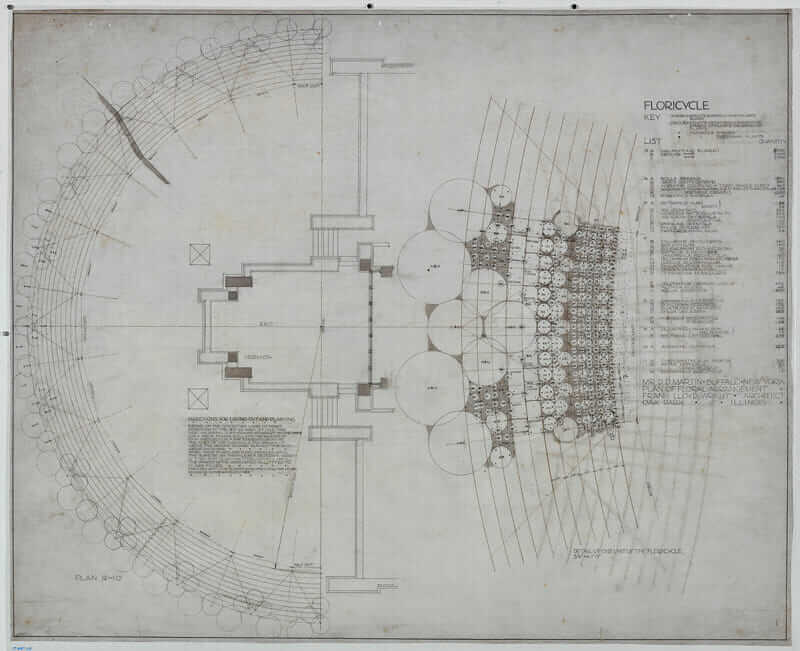 Courtesy The Frank Lloyd Wright Foundation Archives (The Museum of Modern Art | Avery Architectural & Fine Arts Library, Columbia University, New York). Wright is known for establishing and espousing the principles of “organic architecture”—the idea that the built environment should mimic the natural environment and integrate with it. “His lifelong concern with the relationship of what humanity builds to the natural setting and to the larger ecology of sites in diverse regions is of enormous actuality,” Bergdoll says. That concern is the foundation on which modern sustainability is built, according to Freed, who notes that Wright oriented his buildings toward the sun long before daylighting and passive solar heating were trendy. He also leveraged passive cooling and locally sourced building materials (including sustainably harvested wood), and he designed his buildings with dimensions that mirrored those of mass-produced materials to reduce construction waste. 2. He championed design thinking. Human-centered design—designing buildings, objects, and software with users in mind—is all the rage in Silicon Valley and other innovation centers. Wright was one of its earliest proponents. Frank Lloyd Wright. Courtesy The Frank Lloyd Wright Foundation Archives (The Museum of Modern Art | Avery Architectural & Fine Arts Library, Columbia University, New York). “Mr. Wright liked to get to know his clients. He wanted to see how they really lived so he could identify problems that needed to be solved,” Freed says. Wright’s legacy isn’t just architectural; it’s also social and political, according to Aaron Betsky, dean of the School of Architecture at Taliesin (formerly the Frank Lloyd Wright School of Architecture) in Scottsdale, Arizona. Case in point: Wright’s “Usonian” homes—the term he coined to describe a distinctly American approach to architecture that reflected the country’s democratic ideals. 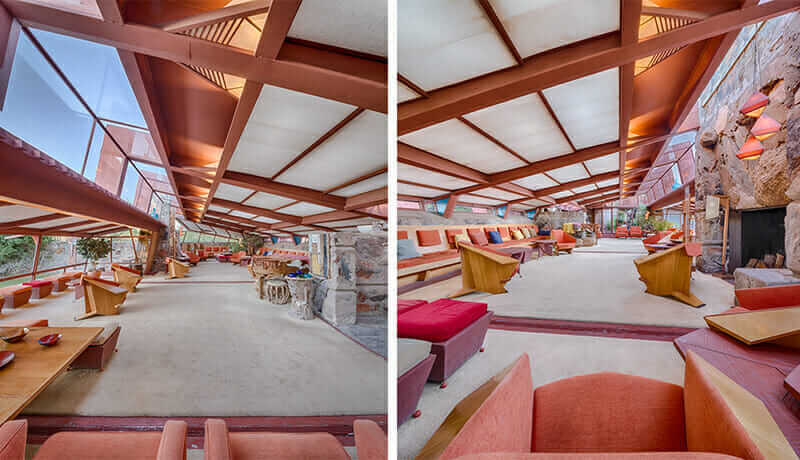 Taliesin West, Frank Lloyd Wright’s winter home and school from 1937 to 1959 in Scottsdale, Arizona. Courtesy Andrew Pielage/Frank Lloyd Wright Foundation. “He wanted beautiful houses and quality architecture to be available to everybody … so he constructed these modest, affordable, and very lovely Usonian homes,” explains Graff, who says the typical Usonian home cost $5,000—the equivalent of $85,000 in today’s currency.